With a history that dates back to 1929, the law office of Haddad & Haddad in Clinton Township, Michigan, has served the needs and interests of a diverse range of clients throughout Macomb County and the greater Detroit metro region for nearly 90 years. In addition, we also offer exceptional counsel and support in many other legal areas as well, including Social Security Disability, workers' compensation, intellectual property protections and more, so that you can find the solutions you need for virtually any legal issue affecting your life, your livelihood and your future all under one roof. A family-run practice, we promise to treat you with the same care and respect we would as if you were a member of our own family, and you can always trust that we will keep your rights and best interests at the forefront of our efforts as we aggressively pursue the most favorable outcome on your behalf. 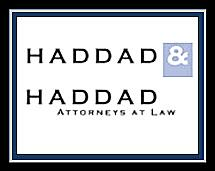 To schedule a free initial consultation concerning your matter, you can contact Haddad & Haddad by calling our law office or visiting our website to speak with one of our dedicated attorneys. We offer a variety of fee schedules, including contingency-based fees for our injury clients, and flexible payment options so that you can secure the quality representation you deserve without worrying about the cost.